Mozilla's Director of Developer Relations, Christopher Blizzard, sat down with Gizmodo to discuss Firefox's mobile browser (formerly known as Fennec). Blizzard took the opportunity to reaffirm the company isn't developing for Windows Phones. This isn't anything new but it's more so how Mr. Blizzard make the affirmation that caught our attention. "[On Windows Phone 7] they said, 'You can use stuff in Silverlight if you want, but you have to come through our app store, and we get to veto.' We're not going to bother. They're gonna ship some version of IE, which is gonna be terrible..."
"We were going to do Windows Mobile because Windows Mobile really needed a good browser, but they shut down their platform.". We can't blame for Mr. Blizzard presenting Mozilla's mobile browser as the best thing since sliced bread but there are good browsers out there for the Windows Phone. Skyfire and Opera come to mind. 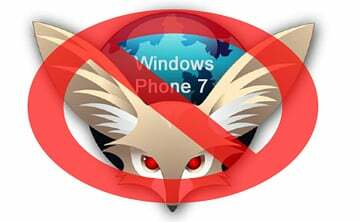 So, can a Windows Phone 7 ever survive without Mozilla's mobile browser? Are the current crop of browsers on Windows Mobile that bad? Personally, I think Mr. Blizzard is well off the mark. How about you?